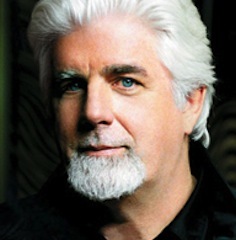 Michael McDonald, king of blue-eyed soul, entertained royally before a Cincinnati Pops crowd Friday night at Music Hall. The five-time Grammy Award-winner/multi-Grammy nominee cut quite a figure, with his trademark white hair and high, keening baritone. Conductor John Morris Russell led the Pops with expertise and high spirits. It was a showcase of McDonald hits, going back to his days as front man for the Doobie Brothers (1977-82). He performed not only his own songs, but songs by others, including “Hey Girl” (Carole King), “I Heard It through the Grapevine” (made famous by Marvin Gaye), Ketty Lester’s “Love Letters” and Brenda Lee’s “Someday You’ll Want Me to Want You,” a personal favorite from his childhood, McDonald said. He opened with “Peace” from his album “This Christmas," a song “we sing every night of the year,” he said. Seated at his electric piano, he sang gently and earnestly into the microphone, setting a heartfelt tone for the evening. McDonald and his band – Bernie Chiaravealle (guitar), Pat Coil (keyboards), Mark Douthit (saxophone), Dan Needham (drums) and Timmy Sims (bass) – followed with MacDonald’s quintessential R & B hit, “Yah Mo B There,” another song with a spiritual message, sung with conviction and deep feeling by McDonald with backup vocalist Monet Owens. This is the song, by the way, heard in the electronics store in the film “40-Year-Old Virgin,” but, unlike Paul Rudd, no one in Music Hall “threatened to burn the place to the ground.” There was also “Sweet Freedom,” featured in “Running Scared,” where the Pops did threaten to overwhelm the singers (a recurring problem during the evening). “Hey Girl” was slow, lazy and aching, while “I Can Let Go Now” with the Pops strings dripped with nostalgia and resignation. “We’re going to do ‘Keeps You Runnin’,” McDonald announced, prompting applause and recognition from the crowd, as did “Ain’t No Mountain High Enough,” where he and Owens soared. He closed with “What a Fool Believes” (1979 song of the year), another hand-clapper, which brought the cheering crowd to its feet. His encores were Eddy Arnold’s “You Don’t Know Me,” where he crooned along with Douthit’s pealing sax, and “Takin’ It To the Streets,” another over-the-top Doobie Brothers hit (the first to feature McDonald on lead vocals) which he dedicated to first responders and American troops abroad. Russell and the Pops opened the concert with music of the 70s, including Otis Redding’s “Sittin’ on the Dock of the Bay” and Quincy Jones’ “Soul Saga” (“Song of the Buffalo Soldier”), the latter in an evocative Henry Mancini arrangement, featuring a blazing Douthit on alto sax. Chick Corea’s “Spain” blended classics (Adagio from Joaquin Rodrigo’s “Concierto de Aranjuez”) and jazz in a fine arrangement by Pops guitarist Tim Berens, who played solo guitar, with the Pops’ Christopher Philpotts on English horn. Also heard were Bruce Springsteen’s “Born to Run” in a big, beefy Berens arrangement and Black Sabbath’s gruff, pounding “Iron Man” (also arranged by Berens). The concert, first of the season in the Pops Remix Series (featuring contemporary artists and bands), repeats at 8 p.m. tonight at Music Hall. Tickets at www.cincinnatipops.org or call (513) 381-3300. The next Pops Remix concerts are "Classical Mystery Tour" Feb. 9, celebrating the music of the Beatles, and R & B group Boyz II Men April 29. Information at www.cincinnatipops.org.